Looking to upgrade your bathroom or space but not sure how? Here are a few reasons to consider tiling and how to choose the best tiles for your space. Handmade tiles are manufactured by hand in a number of different ways. They can be baked in a kiln or laid out to cure naturally just like concrete. The manufacturing process will affect the end result and appearance of the handmade tile. The beauty of handmade tiles that are baked in a kiln undoubtedly lies in their slightly imperfect appearance. Colors and designs are never completely the same or uniform, there may be slight markings on the tiles and edges may be irregular. During the firing process, they may even develop slight cracks in the glaze (also known as crazing). The blend of precise details and imperfections make handmade tiles breathtakingly unique and beautiful. 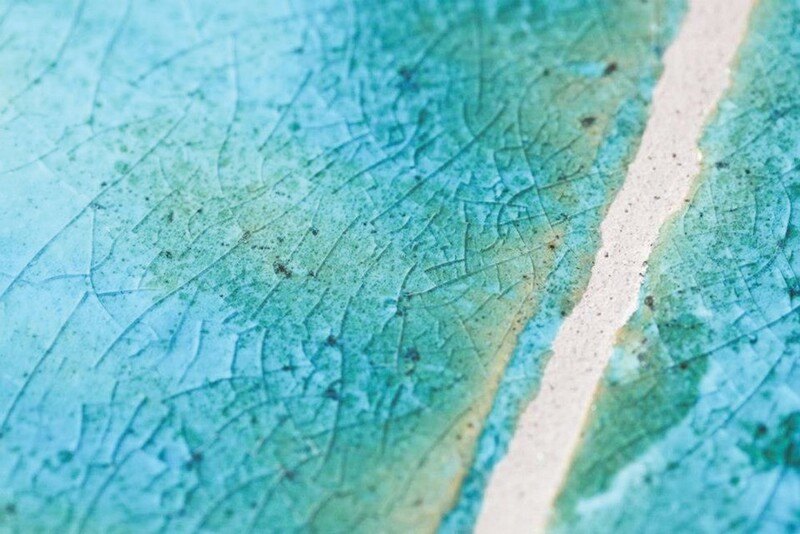 Color can vary drastically from tile to tile in handmade tiles. This is due to the firing process and the variation of heat that occurs in the kiln while baking. 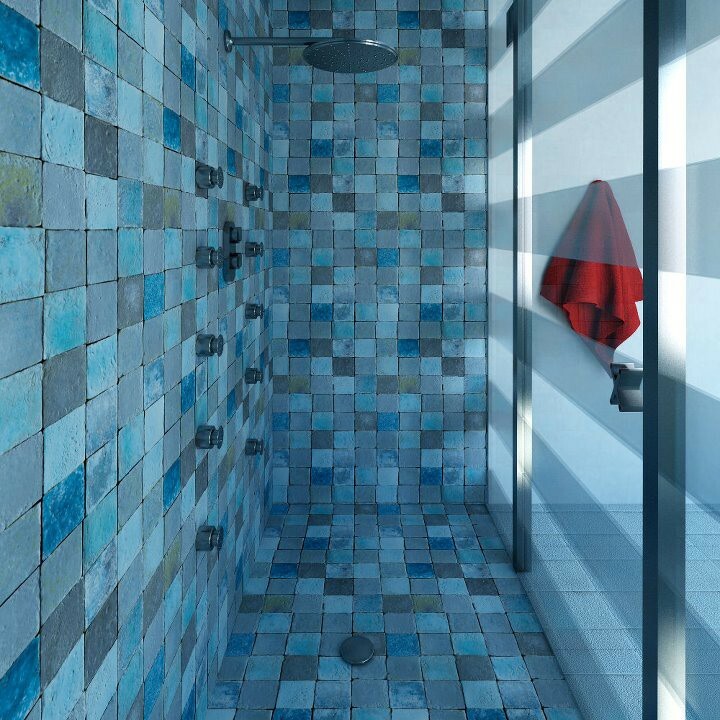 The glaze will set differently in each tile creating a distinctive and stunning visual effect when tiles are installed. Another type of handmade tile is cement tile, sometimes also known as encaustic tiles. These tiles are made by hand, one at a time using cement, color pigments, a mold and a hydraulic press. No kiln is required. Cement tiles go back as far as the 1800’s and have since provided a characteristic that embellishes homes, mansions, palaces and important buildings. Today, this style of tile is gaining enormous popularity once again as traditional patterns blend with modern twists. 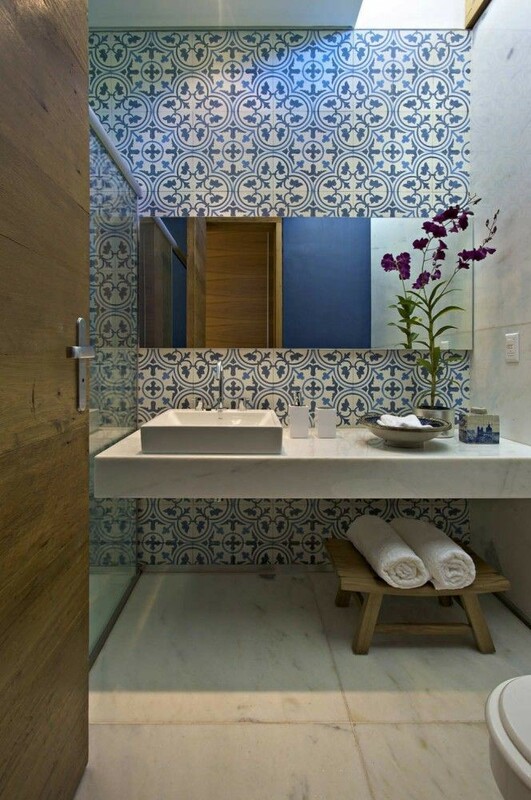 This stunning bathroom uses colored encaustic tiles on the floors and as a panel behind the bath. This feature stands out in the stark white bathroom and adds color and plenty of personality. 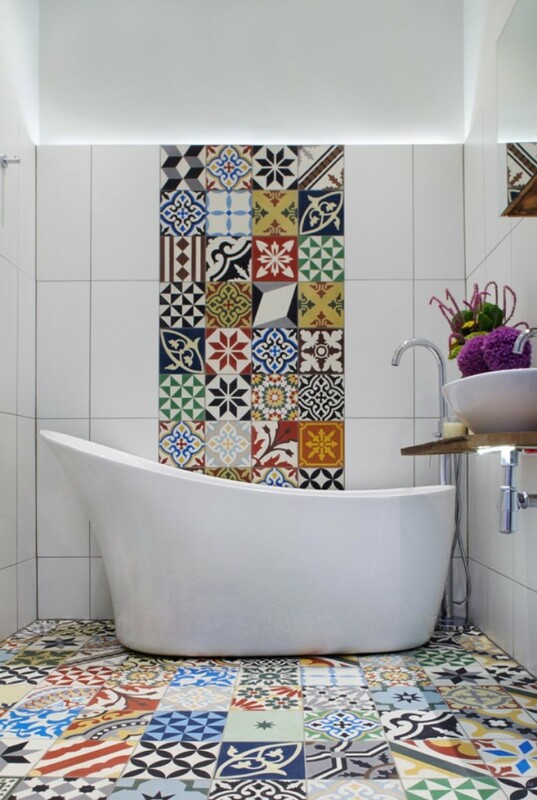 Encaustic tiles used on a feature wall like the bathroom above create an impressive design statement. The cost of handmade tiles is usually higher than regular tiles due to the labor and time involved in producing them. Handmade tiles are usually priced per piece so it’s important to be careful when deciding quantities. You may need to reduce the area to be covered to fit in your budget. Once you decide on the perfect tile, be sure to order your tiles straight away. Handmade tiles are usually made to order and this process may take up to 4 weeks depending on the number of orders in front of yours and quantities required. Avoid disappointment and order tiles well in advance. Once your tiles have arrived and are ready to be installed, ensure your tile contractor has worked with handmade tiles in the past and is prepared for the possibility of variation in thickness, sizes or imperfections. An experienced tiler will understand the expense and irregularities of handmade tiles therefore will take the time and effort to arrange each tile before installing. Most unglazed handmade tiles need to be sealed, as they are generally quite porous. Sealing will protect tiles from staining especially in wet areas. You will need to re-seal tiles after a while depending on where tiles are installed and how much traffic and wear and tear they are getting. When cleaning handmade tiles, be sure to use mild cleaning products and avoid anything that contains acid or bleach. It’s important to speak to your tile supplier or tile contractor if unsure. Author Bio: Kate Fuller is the Marketing and Communications Coordinator with Perini Tiles, a supplier of beautiful tiles and bathroom and kitchen design consultation, based in Melbourne Australia. Dishwasher Buyer’s Guide: Built-in or Portable – How Do I Choose?